S. Neumeier, H. U. Rehman, J. Neuner, C. Zenk, S. Michel, S. Schuwalow, J. Rogal, R. Drautz, M. Göken. 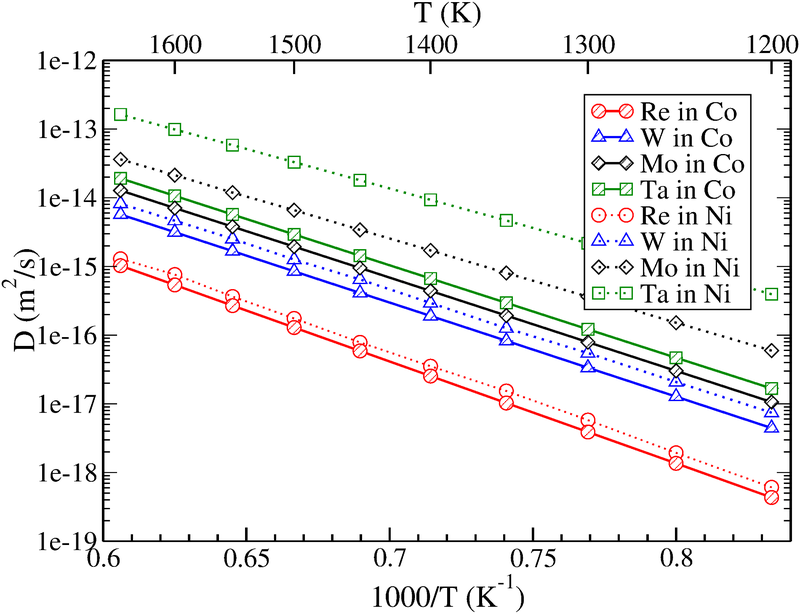 Comparison of diffusion coefficients of solute atoms Re, W, Mo and Ta in Ni and Co. The diffusion coefficients have been calculated using kinetic Monte Carlo simulations with input parameters from density-functional theory calculations. The interdiffusivity of Al and the transition metal solutes Ti, V, Cr, Mn, Fe, Nb, Mo, Ru, Ta, W, and Re in fcc Co is characterized at 1373 K, 1473 K and 1573 K by binary diffusion couples. The experimental results are complemented by first-principles calculations in combination with kinetic Monte Carlo simulations to investigate the diffusion of Re, W, Mo and Ta in fcc Co. The interdiffusion coefficients of alloying elements in fcc Co are generally smaller than in fcc Ni, but the correlation between interdiffusion coefficients and the atomic number of metal solutes is comparable in Co and Ni. With increasing atomic number and decreasing atomic radii the interdiffusion coefficients of the investigated elements, except for Mn and Fe, decrease strongly. The trends in the diffusivity determined by experiment and simulation are in excellent agreement. Re is the slowest diffusing element in fcc Co among the investigated elements. The electronic structure calculations indicate that this is caused by strong directional bonds between Re and neighboring Co atoms. The overall lower diffusivity of solute atoms in Co as compared to Ni suggests that diffusion controlled processes could be slower in Co-base superalloys.